If you are not familiar with the Darwin awards, they are (slightly insensitive) awards given to those who passed from this world for less than intelligent reasons. For example, a woman who thought it a good idea to ride on top of a mattress, that was on top of a van, down the expressway. Well I am going to put a simple warning out there for you and your feet because I see it every year and often think to stop my care and yell at people. 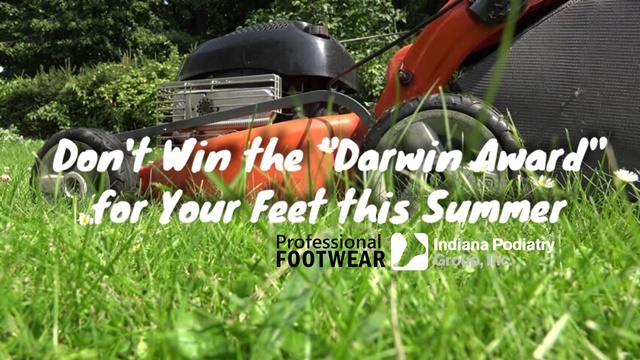 DON’T MOW YOUR LAWN BAREFOOT OR IN FLIP FLOPS! It’s as simple as that. Save the Piggies campaign sponsored by Dr. Gumbiner at Indiana Podiatry Group!